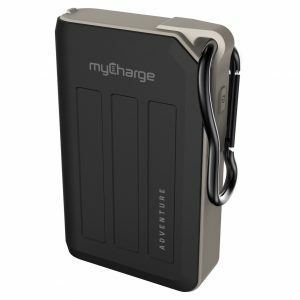 So, it has been quite a while since I reviewed a myCharge product. In case you are not aware, they make a lot of mobile batteries, you know, those things that you need when you need power to your mobile device. I feel good to review the AdventureUltra and the AdventureMax. The first thing that I have to say is holy…cow. Normally, when reviewing a mobile battery, I have very little to say, as they are all alike. However, the AdventureUltra is like a mobile battery on…yeah, I’m not going to say it. Yeah, that’s right, you can actually plug in something here. Now, I want to give a little disclaimer because there is a a warning that it can charge anything up to 45 watts. That’s good for a laptop, even if you have to close the screen to charge it. I have been told that it is also good for powering a 42-inch television for up to three hours. All that is required is to plug in a device and hit the power on button. It can rapidly recharge and hold its power for about a year. It is really great to have, and I am going to recommend it, especially for the holiday season. 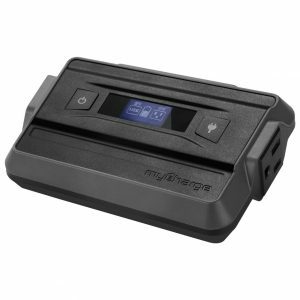 It is available on the myCharge website fro $129.99. Okay, now for another king of mobile batteries with the AdventureMax, as it is a 10500 mAh portable charger, but this one fits well in your pocket. I should have probably mentioned that the AdventureUltra was a bit larger, and would only fit in your pocket if you have a big pocket. Not only is there a great charger, but it is splash resistant, drop resistant, and drop proof. So it is really is great for on the road, and you can see it has a built-in carabiner clip for the belt loop. If this sounds good to you, you can get it on the myCharge site for $49.99.